Sometimes I grab a book from the library thinking it will be an interesting read to pass some time. Sometimes, those "filler books," as I call them, end up being among the best books I've read in the last month or two. Such is the case with The Boy at the Keyhole by Stephen Giles. I first picked it up thinking that it sounded interesting and that I might read it. I ended up leaving it behind at the library twice before finally bringing it home. And am I glad I did. Samuel Clay is nine years old, living in a manor house with Ruth, his caretaker. His father is dead, and his mother has gone off to secure the funds that will keep their mills solvent. It's been months since Samuel last saw his mother. Daily he hopes that she's finally home when he gets back from school. Instead, he's placated with a series of postcards sent from his mother's journey around the United States. He's mapped out her travels in an atlas, hoping that the next word he receives is her coming home. After the death of his father, the business and the manor house are in grave danger of going bankrupt. Rumors swirl around the village around Ruth's actual motivations. Why would she stay on to take care of a little boy who wasn't hers, especially when there was no money left? Devious tales from the minds of little boys fill Samuel's head with questions. He begins to look at every aspect of his life, trying to discern the truth. Everyone has an ulterior motive and no one will seemingly tell him the truth. Samuel suddenly has trouble living his life under a web of lies. Even his friends can't be trusted. As he digs into the dark corners of his family's life, he begins piecing together his version of reality. Through it all, Ruth, despite her cantankerous relationship with the boy at times, ultimately is there to protect him, from the world and himself. How far will she go to protect the boy? This book is a thriller from the start. The author leaves the reader questioning "What DID happen to Samuel's mother?" There are hints left along the way that first set you up to view things one way, and then other hints that have you questioning what you thought you had just figured out. By the end of the book, you think you know what's going to happen, but when you get there, you reread it in disbelief. It's not what you're expecting. There are some points that were telegraphed from pretty much the start. I won't spoil them here, but you'll figure out one of them almost immediately However, it doesn't detract from the story. In fact, it makes for a great backstory that makes you question everything you thought you'd learned throughout the story. This was a very quick read for me. Stephen Giles starts the narrative and doesn't let go until the last page. The non-stop thinking of a nine year old boy shines through in his creation and life of Samuel. Everything centers around this boy and what he's thinking. It's scattered and it dwells on the fantastic, just like every nine year old boy I've ever met. Sometimes my own brain still operates that way. Meanwhile, the other main character, Ruth, seems distant and cold. And that's perfect. She's ancient to the small boy. She won't let him do whatever he wants. He looks at her across the divide of decades and can't believe she could ever recognize the hyperactivity and angst of childhood. Ruth is the caretaker, meant to do what's best for the boy, not to coddle him. Giles does a wonderful job of looking at this adult from the point of view of a child. 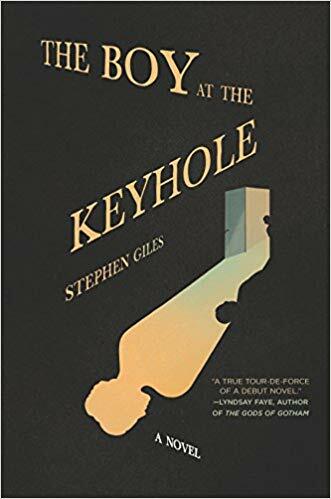 I highly recommend The Boy at the Keyhole by Stephen Giles. You will get through it rather quickly, your heart beating a little faster, and questioning the sure things in your own life. This was his first novel for adults. I certainly hope it's not his last. Craig Bacon still daydreams about those nooks and crannies at his grandparents' houses and what could be hidden in those dark corners.